In talking with clients in and around the greater Phoenix area about home remodeling projects, their number one choice seems to be the kitchen, but coming in as a close second to the kitchen is remodeling their bathroom(s). 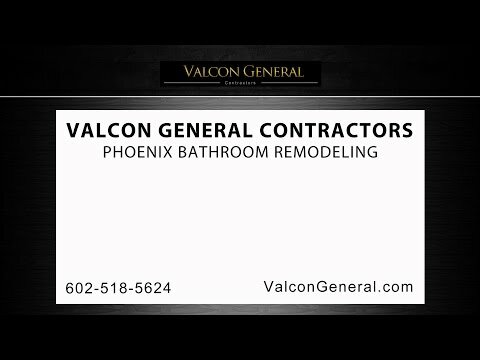 Valcon General has almost fifteen years of experience in bathroom remodeling with over a hundred bathroom projects completed in cities such as Chandler, Cave Creek, Gilbert, Mesa, Phoenix, Glendale, Peoria, Phoenix, Scottsdale, Tempe, and numerous cities across the Valley of the Sun. We believe that the bathroom design should reflect your tastes which reflect how you have decorated the rest of your home, thus ensuring it will add to the home you already have designed. When Valcon General begins the bathroom remodeling process, the very first step taken is to sit down with our clients and go over the entire bathroom remodeling project in great detail, leaving no stone unturned. In taking this approach with our clients, we have a greater understanding of what our client wants so there are no surprises, and they get the remodeled bathroom they always dreamed of. In using this type of program, our clients become more satisfied with the project, evidenced by the fact that the vast majority of our bathroom projects have come from referrals from previous clients of Valcon General. The one great thing to remember about bathroom remodels these days is that there are no limits as to what can be done. Just about everything you can imagine can be done. In choosing which General Contractor will work on your Phoenix bathroom remodeling project, it would it be wise to hire one that has the vast experience and expertise that this type of project will require but one that is also fully licensed and insured as well. This is why so many clients choose Valcon General for their bathroom remodel projects. In addition, all our sub-contractors are contractors that Valcon General has used for years, very experienced in bathroom remodels, and, again, are fully licensed and insured for our clients’ peace of mind. At Valcon General, we understand that there are quite a few items to consider when hiring a General Contractor for your bathroom remodel, regardless of whether it is a complete remodel of your bathroom(s) or simply doing some minor upgrades. If your criteria is hiring a General Contractor with the expertise and a stellar reputation for bathroom remodeling across the Valley, then Valcon General is the GC you want managing your remodeling project. We would be honored to bring your dream bathroom remodeling project into a reality.